I have been full all day. Several big waffles with butter, syrup and ham for breakfast. Lunch was only half a Subway then a pint of Ben & Jerry’s Neapolitan Dynamite (1000 calories right there). For dinner we barbequed with Chris and Carol, our local angels. It was truly a feast and I couldn’t even start on the chocolate cake Blue Sky had baked. Somewhere in there I managed to buy and pack 7 days of food and slack pack from Tehachapi-Willow Springs road to Highway 58 thereby finishing section E and entering the Sierra Nevada. Slack packing usually implies an easy time but with Vortex’s enthusiasm and energy we took it to another level and ran most of the 9.5 miles to get to our pick-up point exactly 2 hours later. The path was easy to follow over open fields of dry grass under the constant whirring of wind turbines. Vortex must have been a ‘track’ star at school because he vaulted over most of the pipe gates that were almost chest height using only his hands and I even saw him jump 4ft straight up to land both feet on one (a metal pipe 3 inches in diameter) then jump off the other side and keep running. I wish I had that on camera. Having had so many zeros near Agua Dulce and then busting out 26, 30, 24 to get here I am glad I did some mileage today. Zero days can be relaxing but getting to Canada is always on my mind and I feel guilty when I’m not working on that goal. Doing that section means we only have 15 miles to the water source tomorrow and considering how much my pack weighs I am very happy about that. I can’t finish this entry without sending out thanks to our incredible hosts Chris and Carol Rush. They have been so kind and helpful every step of the way. They’re certainly not a big outfit like the Saufleys. Just a great couple in a regular house that looked after the three of us since we met them on the hill. We really fell on our feet here and I just noticed my current mileage according to the data book is 567.8, cool. 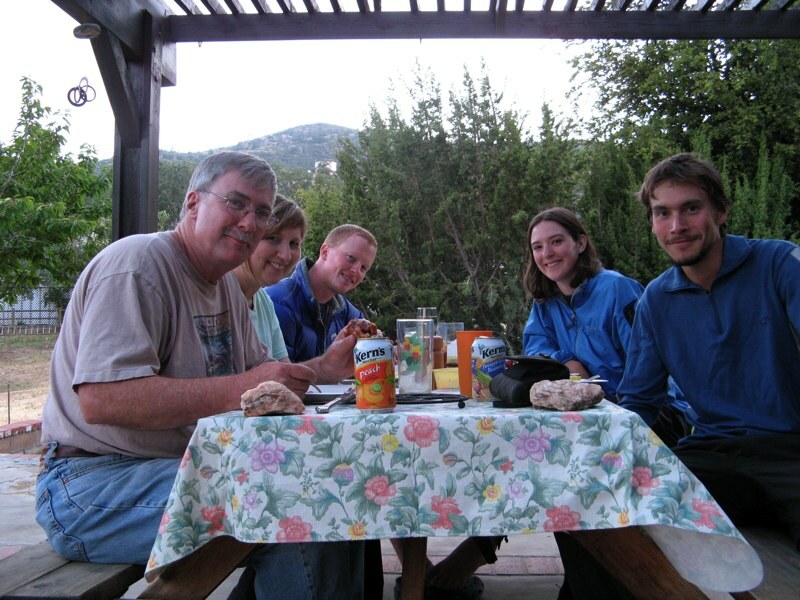 This entry was posted on Monday, May 28th, 2007 at 6:21 pm	and is filed under California, Hiking, Photo. You can follow any responses to this entry through the RSS 2.0 feed. Both comments and pings are currently closed. Yup – 567.8 miles is pretty darn cool indeed! Pretty impressive infact! The hospitality extended to you by the Rushes and others along the trail is heart-warming. Vortex has certainly added a challenge to the daily routine of walk, walk, walk. We also encourage people to leave water at the water cache on Cameron Rd. & Tehachapi Willow Springs. I’m envious too. My hiking days almost finished with the arrival of seven small children from 1977 to 1996. Now one of those is the author of this journal so I get to ‘hike’ the PCT from my desk at home. We have a filter that pulls out any comments that contain URLs. They are usually just spammers taking advantage. Since you are obviously hiker-aware and support the Cameron Rd cache, and SunWalker benefited from the generosity of Tehachapi residents your comments are welcome.